High up in a converted warehouse in Clerkenwell, London, the sunny, pine-floored rooms of Alan Kitching’s studio seem a tranquil retreat. But what distinguishes them from the environments in which most designers work is the collection of letterpresses on which his purely typographical designs are created: two ornate Victorian Albion presses – there more for decoration than anything else – and a Stephenson Blake proofing press, together with dozens of slim wooden drawers filled with wood and metal type. Since he did his six-year apprenticeship as a compositor in the 1950s, Kitching has seen letterpress printing shift from being the standard way of working, to an old-fashioned technique, to becoming, in the last five years or so, completely archaic. But unlike many of those who work in the medium today, Kitching is not steeped in nostalgia. For him, the fact that letterpress printing has undergone this transition has been a liberation – particularly when it comes to teaching. No longer obliged to ensure that his students learn the rudiments as a matter of course, Kitching is free to explore whatever aspects of the medium currently interest him, with pupils drawn from disciplines such as photography and fine arts, as well as graphic design, who choose to enrol on his courses. Kitching spends a lot of his time teaching, either at colleges or in his Clerkenwell studio, where he runs workshops several times a year for anyone who wants to try letterpress printing. An increasing number of people do- many of them designers who take a week’s holiday from their own studios in order to attend. In an age when most design is created using a standard keyboard and mouse, there is something fascinatingly primordial about being able to pick up and touch bits of wood and metal type and use real, liquid, ink-smelling ink to make marks directly on to paper. Thirty years later, looking at a well-thumbed copy, it is easy to see why Typographic Norms had such a profound influence. As its title suggests, the book is about typographic standards: point systems, body sizes, leading, spacing. But Froshaug pared down the information to its abstract essence, which, coupled with a minimal design (the title, for instance, is printed in black gloss ink on black card) resulted in a volume whose pages unfold to reveal nothing but patterns of carefully arranged numbers or rectangles- the skeletons of the typographic systems. It is, as Kitching puts it, “almost like a painting” – severely Modernist, yet with overtones of the cabalistic, mystical aura that surrounds the pre-digital craft of typography. Froshaug set up the Experimental Typography Workshop at Watford College, and Kitching worked as his assistant. The workshop, which was separate from the main college printing department, started with just two typefaces, Bakersville and Univers. Two years later Caslon and Bodoni were added: Froshaug considered this range (old serif; sans serif; transitional and modern serif) to be sufficient. In 1970, Kitching produced his own book, the Typography Manual, in a sense his reply to Typographic Norms. Less abstract than Froshaug’s work – it does, after all, contain examples of typefaces, – its acute minimalism nevertheless shows how deeply influenced Kitching was by Froshaug’s aesthetic. Yet looking at Kitching’s work today, with its mixtures of typefaces, colours and layered images, any remnants of Froshaug’s rigorous minimalism are far from obvious. Ask about it, however, and the underlying rationale becomes clear. It is this intuitive way of working, allowing serendipity to combine with theory and logic, which inspired the first of Kitching’s typographic maps. Devised as a project to work on with students at Brighton Polytechnic, it is a typographical representation of the town that includes the sea, the piers, the major streets and places of interest. Instead of outlining the streets, Kitching used their names to indicate their size and relationships. The sea is indicated by numbers giving its depth at different points; the fishing boats are represented by their names. 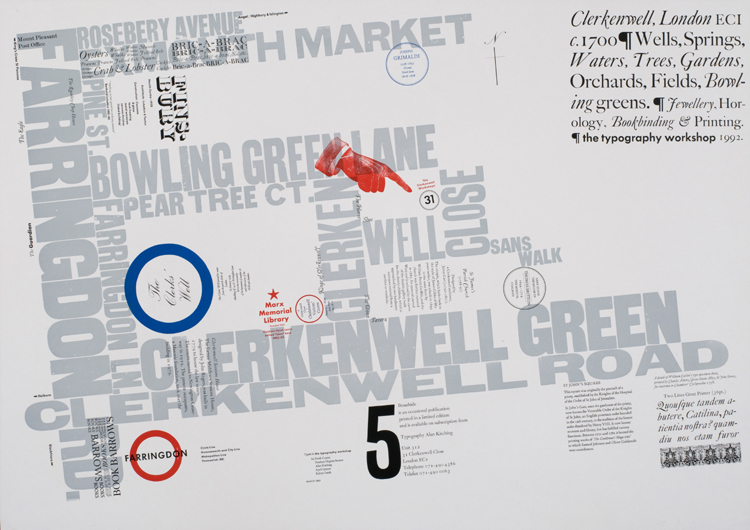 As in the later map of Clerkenwell, the choice of font, point size, colour and positioning communicates much of the character of the area. It is this sense of a personal journey which is, perhaps, the key to Kitching’s work. After 25 years in the profession, many designers have given up pushing the boundaries of their work, taking risks, or experimenting. Kitching, working in the medium he knows best, seems to have only just begun.